This is a rare opportunity to buy a proper German AC SCHNITZER model. Finished in metallic grey & Wrapped last summer in Dark Grey Metallic Matt. The AC SCHNITZER alloys has just been refurbished and resprayed last summer too. This is my car for the last past 6 years and it always gives me huge smile while driving it. I love the E46 Coupe. I have done everything possible to keep the car maintained. This is my WE car that I used only for pleasure on sunny days. I will try to be completely honest here as the car is not perfect, obviously is not brand new, so would be perfect for a petrolhead who likes improving things and make things right. It needs some TLC to make it really good. The wrap on the bonnet needs some attention in the corner but I have the film. Please check yourself on parts with AC SCHNITZER stamp, you will see, so expensive. I am not asking much regarding condition and mileage but believe me that car cost me much much more than the asking price. 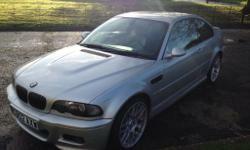 An AC SCHNITZER E46 model in superb condition sells over 4K. 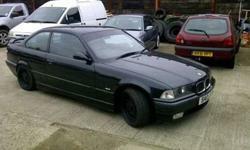 Just the mirrors cost £350, the rear spoiler £200, Wheels £900, bumpers was about £1500 each... So do the maths. I took picture of the engine but sorry I did not have time to clean it otherwise it sounds sweet. So please, I am busy guy so no time waster or silly offer. DO NOT ASK ME what is the lowest I am taking as I am old fashion and I am selling a car not a price, so show me some genuine interest, come, have a test drive and then we talk price. I will have a bit of flexibility depends how fast the payment is. 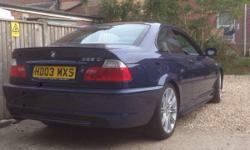 This one is a future classic, rare E46, speciale one. 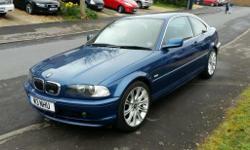 E46 Bmw 318 coupe black leather.